It seemed a sure thing that Charles Leclerc would win the Bahrain Grand Prix. The 21-year old Monagasque driver, in only his second race for Scuderia Ferrari, hadn't put a wheel wrong all weekend. 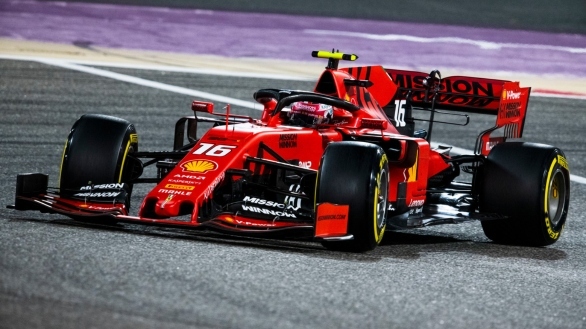 Leclerc had dominated the practice session, and had qualified on pole, setting a new lap record at the Sakhir track as well. And then, fate dealt him, and Ferrari, a cruel blow. Leclerc's SF90 began having issues with the power unit, specifically with one cylinder on the engine failing to perform. This meant that he lost approximately 5 seconds a lap, and was overhauled by Mercedes driver Lewis Hamilton who proceeded to take the lead. Leclerc was also overtaken by the second Mercedes of Valtteri Bottas, which put him down in third overall. With the race finishing under the Safety Car, it meant that Leclerc was able to hang onto the final spot on the podium, not succumbing to the threat of Max Verstappen in the Red Bull Racing RB15. When the five red lights went out at Sakhir, things didn't quite go the way of the pole sitter. Leclerc lost out at the start of the race, with Ferrari team-mate Sebastian Vettel storming past him to take the lead, with Bottas putting his Mercedes in second place. 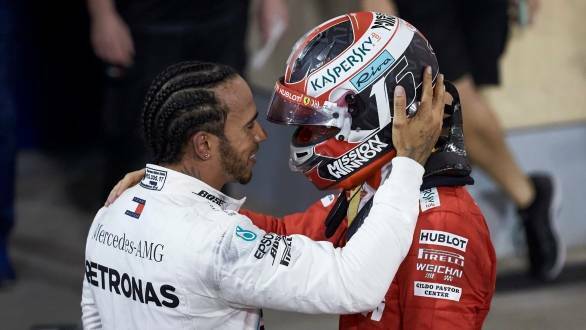 However, at the start of the second lap, Leclerc managed to get past Bottas, radioed the Ferrari team to tell them that he was indeed faster than his team-mate, and then went ahead and overtook Vettel to take the lead. 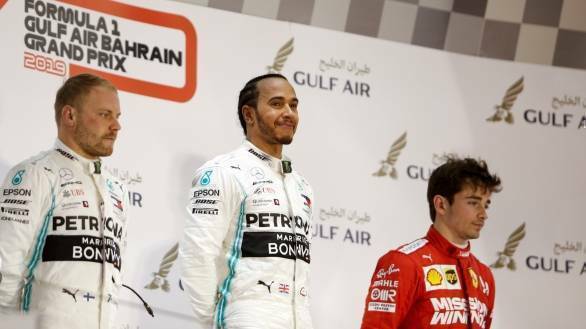 The running order at this point was Leclerc, Vettel and Hamilton, who had managed to get past his own team-mate, Bottas. The first round of pit stops saw Leclerc emerge in the lead of the race, while Hamilton, who had pitted for another set of soft tyres, began losing time, ultimately dropping behind Vettel. The second round of pitstops, however, went Hamilton's way. On the medium tyres, he found himself able to attack better, sweeping past Vettel in the Ferrari. Vettel, who defended hard, spun, damaged his tyre, then lost his front wing, and had to pit. He rejoined the track in eighth place after he pitted for new tyres and a new front end. The run of bad luck for the Scuderia continued, though, with Leclerc reporting an engine issue, losing time with each passing lap. 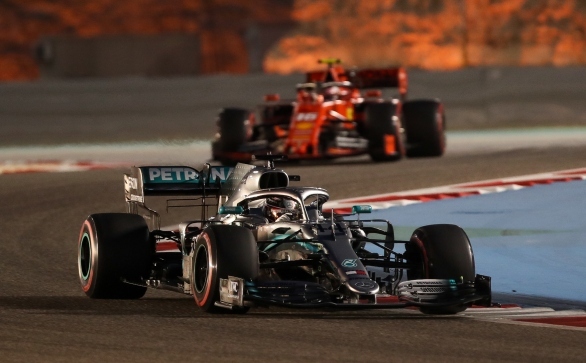 This meant Hamilton took the lead, Bottas moved into second place, and Leclerc was something of a sitting duck, susceptible to an attack from the Red Bull of Max Verstappen. A silver lining for Ferrari, on the otherwise dark cloud that was the Bahrain GP, then showed up. With just three laps left in the race, both Renaults of Nico Hulkenberg (who had done a fabulous job of recovering from 17th to 6th) and Daniel Ricciardo, suffered mechanical failures. With the two Renaults in a dangerous position on track, the Safety Car was brought out. It meant that no overtaking was allowed, and the running order was Hamilton, Bottas and Leclerc. With the race finishing under the Safety Car, Leclerc was able to salvage a podium finish, a small consolation for the loss of an almost certain victory. Max Verstappen was the best of the rest, finishing fourth, while Vettel recovered to a fifth place finish. In his second Formula 1 race, McLaren driver Lando Norris finished sixth, while his team-mate Carlos Sainz Jr retired. Kimi Raikkonen took seventh for Alfa Romeo, Pierre Gasly finishing eighth in the second Red Bull. Alexander Albon took home his first F1 points by putting his Toro Rosso ninth overall. Sergio Perez rounded off the top 10 for Racing Point F1. Antonio Giovanazzi finished 11th in the second Alfa Romeo, with Daniil Kvyat taking 12th in the second Toro Rosso. Kevin Magnussen finished 13th in the Haas F1 (the only Haas to finish, with Romain Grosjean retiring), with Lance Stroll 14th for Racing Point. Williams drivers George Russell and Robert Kubica ended 15th and 16th, the last of the finishers. Valtteri Bottas retains his lead in the driver's championship, by one point over Lewis Hamilton. The two Mercedes Drivers currently have 44 and 43 points respectively. Verstappen is third with 27 points, one ahead of Leclerc who has 26. Vettel, with 22 points, is fifth.